Gone are the days of bulky gadgets which are getting thinner than ever and so are portable power banks! 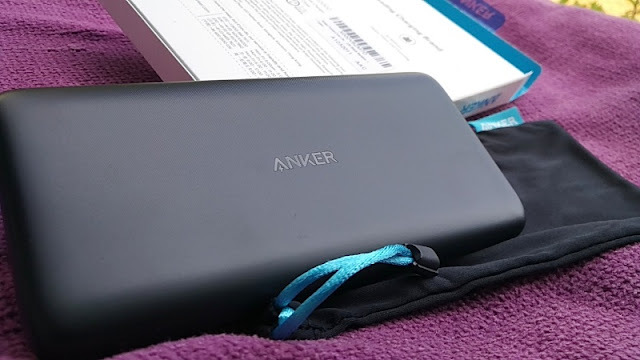 The newest portable charger on the market is the Anker PowerCore Lite 10000, which is also one of the slimmest portable chargers you can buy today, weighing just 211 grams and measuring 144mm long, 72mm wide and 14.5mm thick. 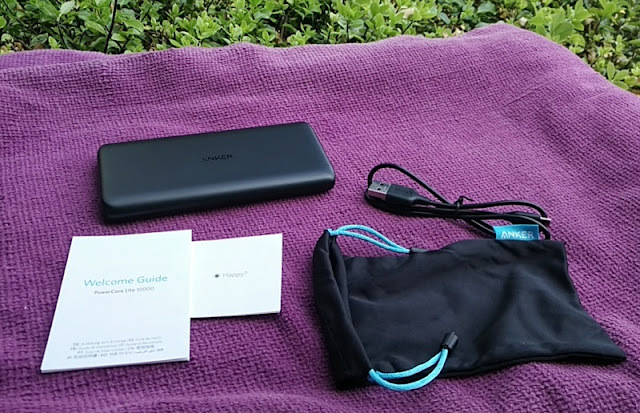 The PowerCore Lite 10000 portable charger power bank comes with USB-C and micro USB inputs and one USB A fast charging speed output (using Anker's PowerIQ and VoltageBoost technology) which deliver the fastest charge possible but not faster than Qualcomm Quick Charge. The PowerCore Lite 10000 portable charger power bank can fully charge the iPhone 8 Plus, Galaxy S9 and iPhone X twice over and a bit. 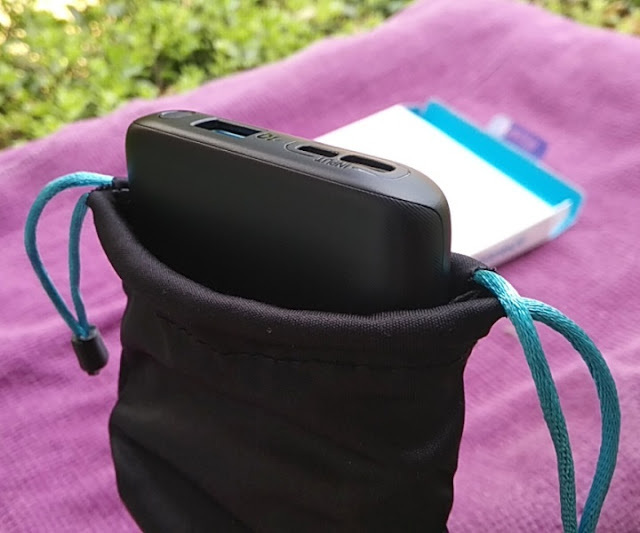 As far charging time, the PowerCore Lite 10000 can charge and iPhone X in two and a half hours which is faster than charging the iPhone X via the included 5-watt USB-A charger. 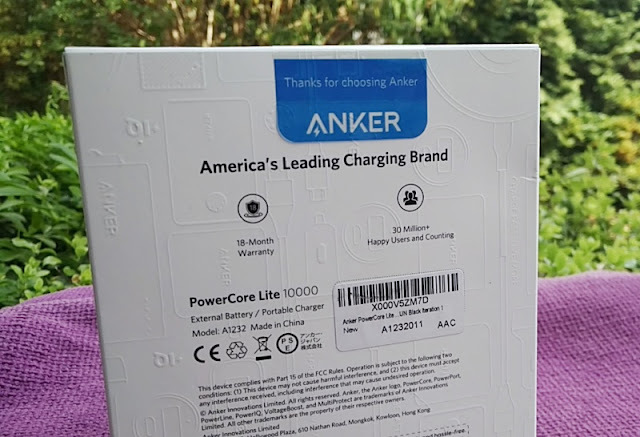 The PowerCore Lite 10000 charger is even almost as fast as Apple's 29-watt USB-C fast charger which charges the iPhone X is two hours five minutes. The construction of the PowerCore Lite 10000 is similar to the PowerCore II with grippy matte black finish exterior, but with a thinner housing. 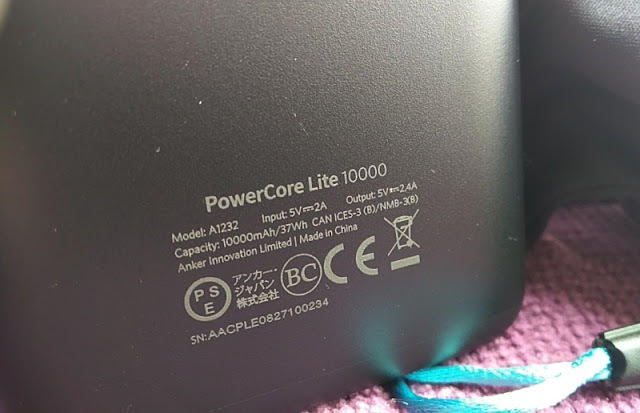 The led power/battery indicators also have a different design on the PowerCore Lite 10000 charger. Instead of the leds being located on the front of the unit, the led battery power indicators are located discreetly on the side of the unit. 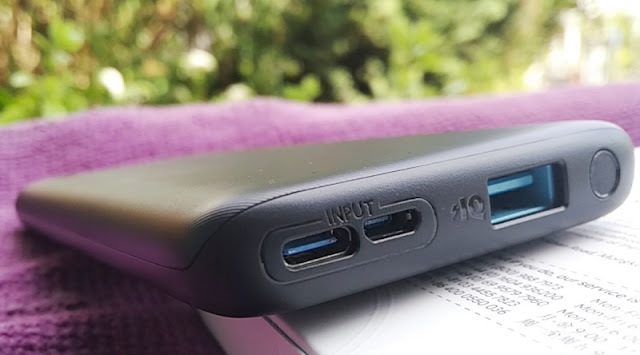 The PowerCore Lite 10000 USB Type C port is input only. 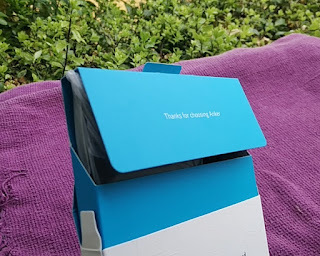 This mean, it does not output power nor Power Delivery so you won't be able to use it as a USB C power delivery port like you can with the PowerDrive+ Speed 2 car charger which can charge the new MacBook and Nintendo Switch from the 12V DC socket of a car. 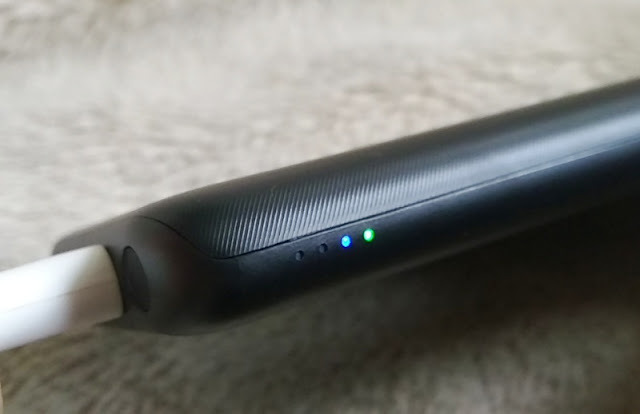 With that said, the PowerCore Lite 10000 power bank has a trickle charging mode (led turns green) that turns the PowerCore Lite 10000 into a trickle charger to keep your gadgets charged at their full level without losing any charge. To enter trickle charging mode, press the button next to the USB port. 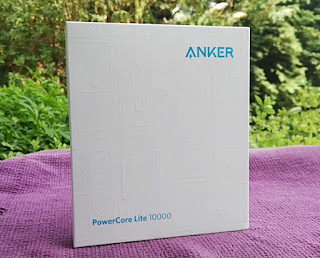 The PowerCore Lite 10000 holds battery charge very well too for several months without recharging, making the PowerCore Lite 10000 power bank a good option for backup power. The Type-C/Micro USB inputs are 5V rated at 2A, while the USB A output is 5V rated at 2.4A. 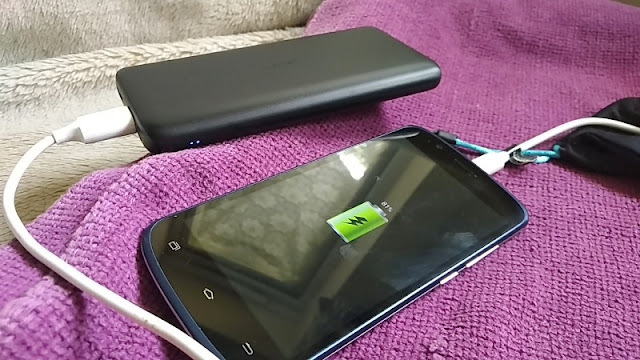 The battery capacity of the PowerCore Lite 10000mAh is rated at 37 watt hours (Wh). 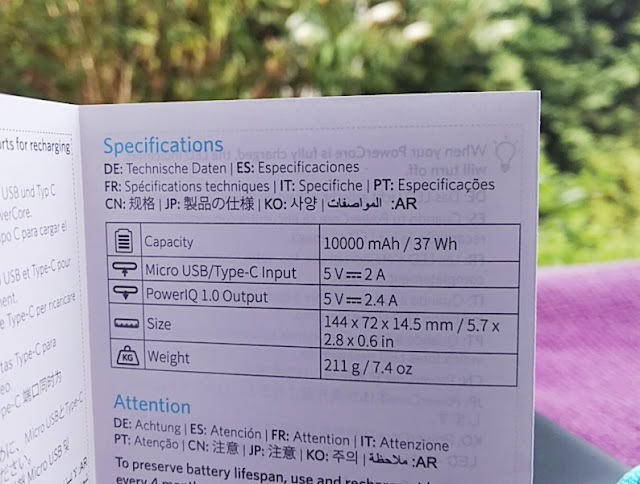 This means, if you plug in a device that draws 5W of power, the power bank will last 7.5 hours (if it draws 10W, the power bank will last 3.7 hours). 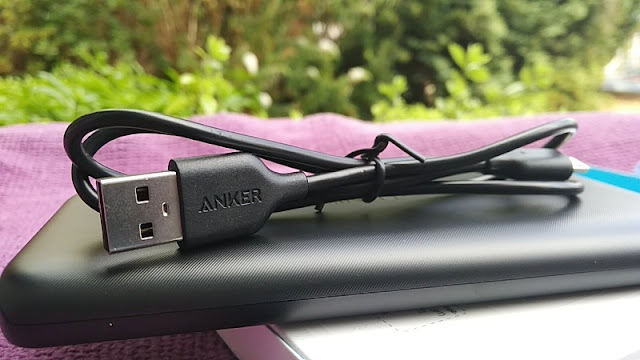 You can charge the PowerCore Lite 10000 via the micro USB port or USB C port but not both at the same time. Since each input port can input a maximum of 5V 2A, charging time takes 5.5 hours when using a 5V 2A wall charger (10 hours when using a 5V 1A charger). 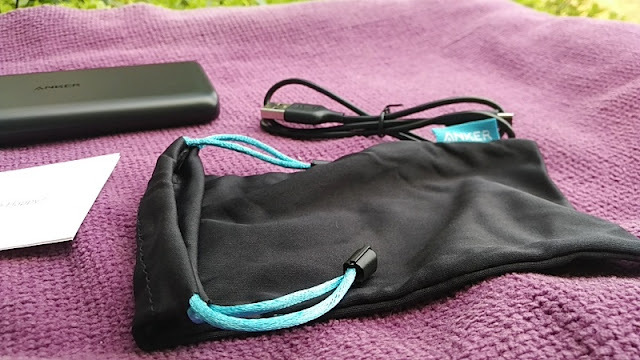 Along with the PowerCore Lite 10000 portable charger, you get a micro USB cable, a silky drawstring pouch, a welcome guide, and 18-month warranty.